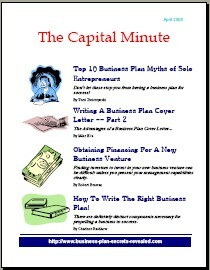 For the Solo Entrepreneur there's "The Top 10 Myths Solo Entrepreneurs Often Have About Business Plans" and how de-bunking them can actually be easy, fun and help jumpstart your success. Plan on pitching your plan? Learn to defend the natural weakness of a business plan cover letter and how to exploit the letters natural strengthens to promote your business plan and attract funding more effectively in Part 2 of "Writing a Business Plan Cover Letter." in "Obtaining Financing For A New Business Venture" you'll see why presenting your management teams capabilities and the value they add clearly in your business plan can help you win over more investors faster. Then find out the other distinct components necessary in a business plan to propel your business to success in "How To Write The Right Business Plan!"